In this series, we've been exploring how to perform common user administration tasks using Navicat's flagship product, Navicat Premium. In the last blog, we looked at the Server Privileges, Privileges, and SQL Preview tabs of the New User Object tab. 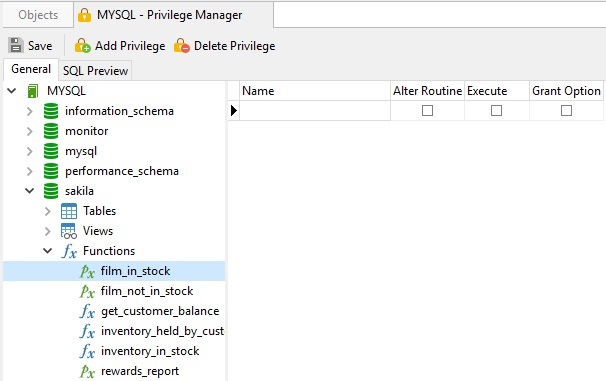 Setting privileges for each user as we did in the last blog is not the only way to do so; the Privilege Manager offers another way to set privileges for a connection as well as its database objects. 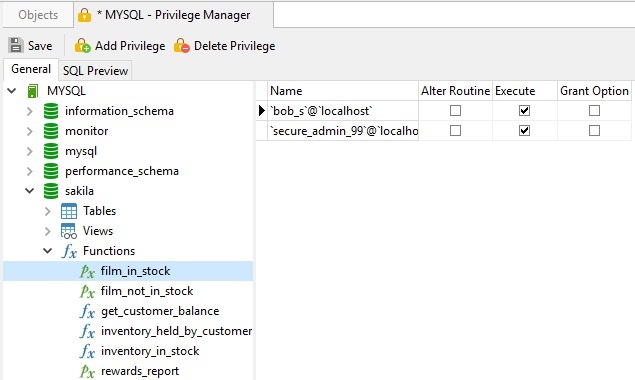 Available for MySQL, Oracle, PostgreSQL, SQL Server and MariaDB, the Privilege Manager will be the subject of today's blog. 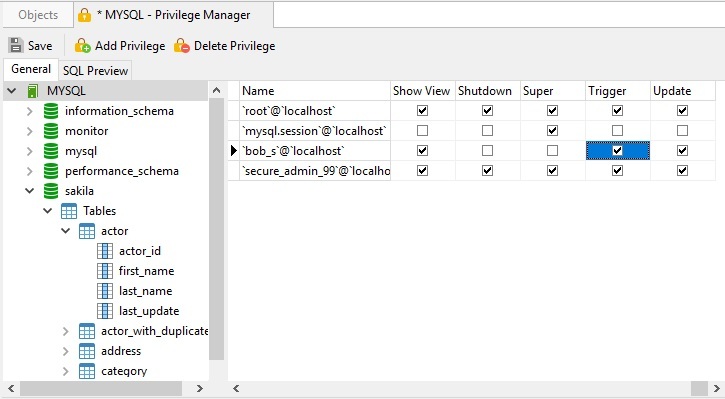 To access the Privilege Manager, click the Privilege Manager button on the User Object toolbar. 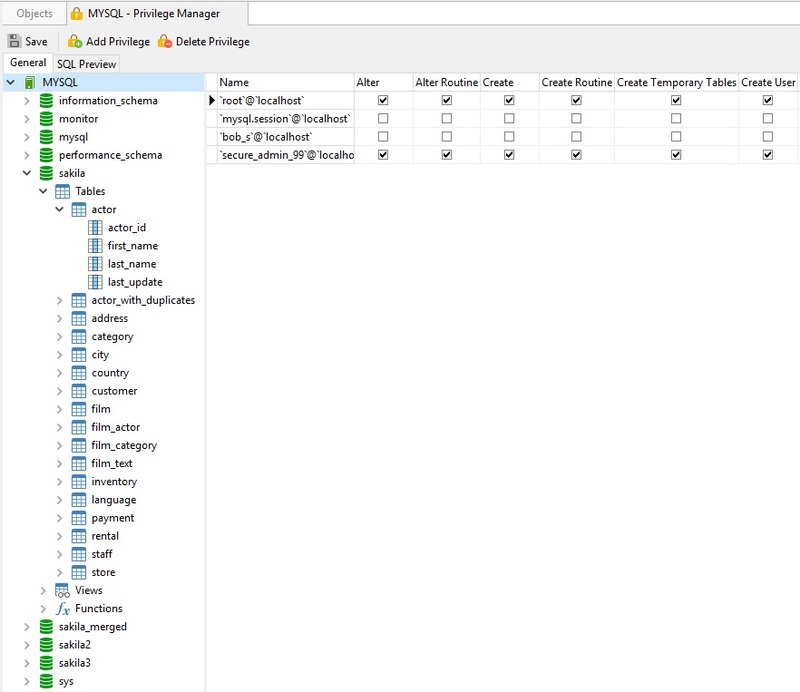 That will open the Privilege Manager in a new tab with the connections for the most recently opened connection. From there, you can either work with Connection-level privileges or those associated with a particular database. Let's start with Connection-level privileges. If it is not already selected, click the Connection name to see a list of users that have access, along with their respective privileges. Scroll the grid horizontally until reaching the target privilege that you're interested in. Conversely, unchecking the box for a privilege removes that privilege. Don't forget to click the Save button on the Privilege Manager toolbar to commit your changes. That being said, if you do, Navicat will ask you if you'd like to save your changes when you close the Privilege Manager tab. Click the Sakila Database in the Object tree. Scroll the grid horizontally until reaching the Trigger privilege checkbox. Conversely, unchecking the box for the privilege listed removes that privilege. Once again, don't forget to click the Save button on the Privilege Manager toolbar to commit your changes. If you do, Navicat will ask you if you'd like to save your changes when you close the Privilege Manager tab. 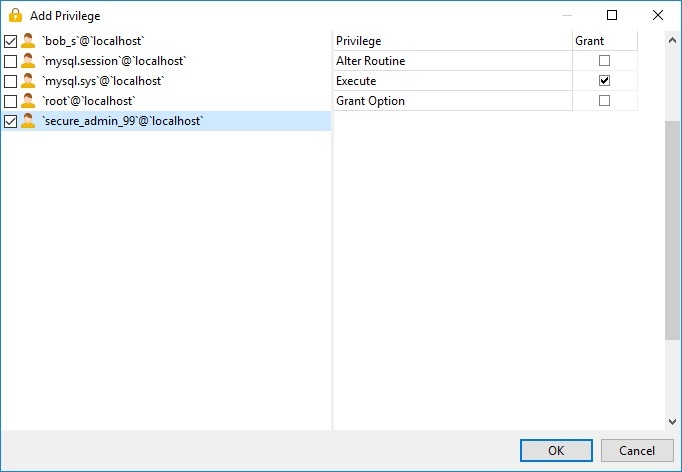 To grant privileges for specific Database objects such as Tables, Views, Functions, and Stored Procedures, use the Add Privilege Privilege Manager tab toolbar button. Choose the film_in_stock object and click the Add Privilege button to open the dialog. Check the box beside the user on the left pane. Make sure that the film_in_stock procedure is selected in the tree view. Select the bob_s@localhost row in the grid to highlight it. Now click the Delete Privilege button to remove that row from the grid. Your changes will be committed when you save your settings.